With a challenge often comes a big reward. Whether a sense of accomplishment or, often in the case of very difficult hiking trails, an incredible view from the top of a mountain. The upper section of the Golden Ears trail is steep, it’s not always clear that you’re on a trail, and it feels like it continues forever. Great views, if you’re not in the clouds. Without question, Golden Ears is one of the most challenging hikes on Vancouver Trails due to it’s length, elevation gain, and ruggedness from not being maintained as well as other trails. The trail doesn’t start out too bad as it’s relatively flat for awhile before it begins to climb and you reach the campsite at Alder Flats. After that, the real climbing begins and it seems as though the trail goes on and on forever. The trail reaches a second campsite where many people stop, however it continues right to the peak. The walk back down is challenging on the tired legs and many people have been caught returning in the dark. If you don’t plan to camp at Alder Flats and make this into a multi-day trip, make sure to leave very early and that you are in extremely good physical condition. You may have hiked 6km but the final section of the trail to Wedgemount Lake goes straight up those rocks. It’s only 7km one-way to the lake, which seems easy, right? Not quite as the trail to Wedgemount Lake climbs more than 1400-meters and the scramble up the final section feels like you’re going straight up a wall. The reward is worth it though as the turquoise lake situated in the bowl with a glacier at the far end of the lake is nothing short of spectacular. There is also several campsite spots at the lake for those willing to stay overnight. One recommendation is to pack a light jacket as the temperature at the lake with the lack of sunlight and winds is often much lower than in the Whistler valley area. After enjoying your time at the lack, watch your step as you navigate your way back down the steep section, before following the rest of the trail back to the parking lot. The view from the Lions is incredible but if you’re following the Howe Sound Crest Trail from Cypress, it’s a long route over two mountains. The Binkert Trail – Starting from Lions Bay, this route follows an old logging road through switchbacks for awhile before veering off and climb through the forest. The climb is steady and continues as you exit the forest and hike up the open rock areas towards the Lions, taking time to enjoy the views of Howe Sound below. Eventually, you reach the crest and a short walk takes you to the base of the West Lion. 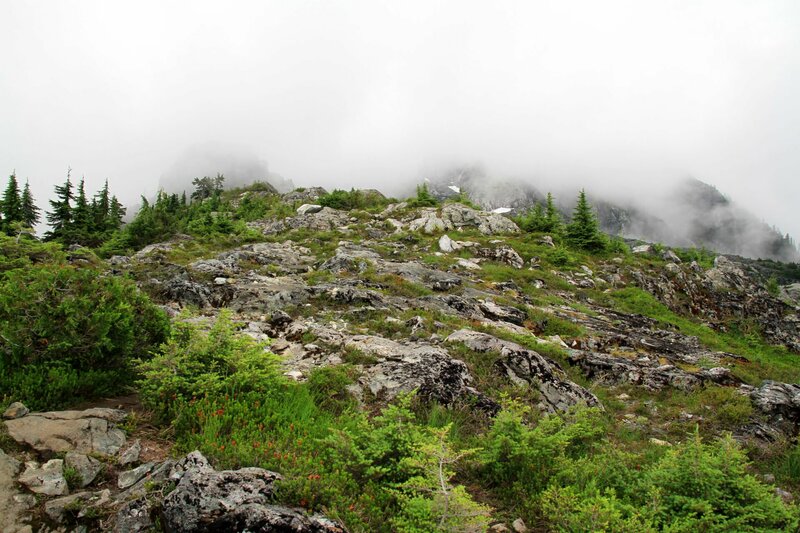 Howe Sound Crest Trail – Don’t let the idea of driving up to Cypress Mountain fool you into thinking this route is easier. The trail starts from the downhill ski area at Cypress Mountain before climbing up to the St. Mark’s Summit. Then you descend from there and climb up a second mountain fittingly called Unnecessary Mountain. You then descend again, although not as far, before making your way up to the Lions. Keep in mind that you have to go over these two mountains on your return trip back to Cypress. The final ascent to Panorama Ridge involves hiking up plenty of loose rock and some snowy patches that linger well into July. The incredible viewpoint from Panorama Ridge overlooks Garibaldi Lake with Black Tusk in the distance making it one of the most scenic views in the region. To do this hike in a day, you have to start early and keep a steady pass as the route is about 30km, although could be a bit shorter if you decide to return via Taylor Meadows and not go to Garibaldi Lake. The only really steep section is the final scramble up the rocks to the top. There are several kilometers, like the section of trail that passes through Taylor Meadows, that has very little elevation gain and you can gain distance quite quickly. However, 30km round trip still makes for a very long day. Pack plenty of water and snacks on a warm summers day, there are very few options for drinking water along the trail. This photo was taken on the trail to Panorama Ridge but the Black Tusk trail will take you right up to the edge of the volcanic rock. 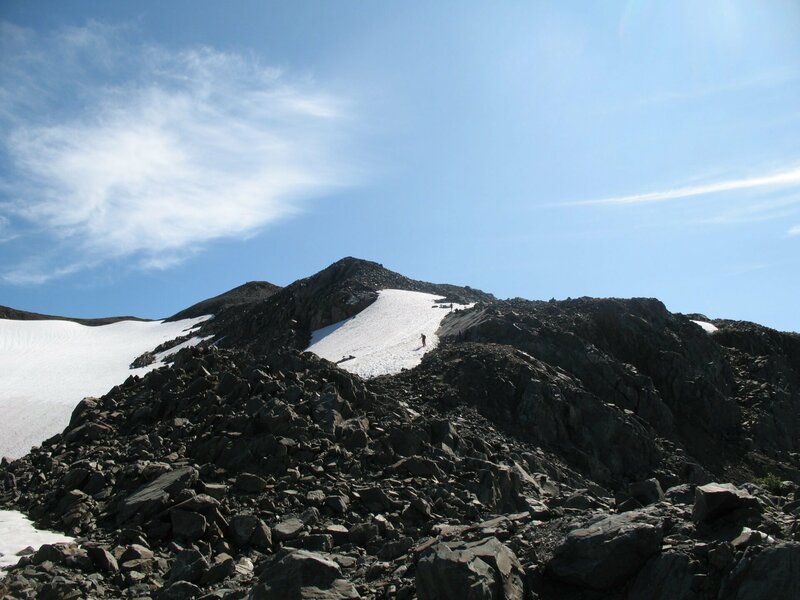 The unique black rock and pointed shape that makes Black Tusk visible from the Sea To Sky highway entices many to want to hike the mountain. To do this in a day, you will need to start early at the Rubble Creek parking lot, hike the first 6km up the switchbacks, before turning left and going through Taylor Meadows. The Black Tusk junction is not far beyond the Taylor Meadows campsite, at which point the trail begins to climb between the grass and wildflowers before reaching an elevation where the vegetation completely disappears. The moving rocks under your feet make the trek even more challenging as you slide back from time to time as you make your way up the steep slope. For many, reaching the base of the Tusk is good goal as the stunning views span across a large swath of Garibaldi Provincial Park. Climbing to the top should only be attempted by experienced and well prepared as the chute on the far side is difficult and dangerous to pull yourself up through. Don’t take chances if you are not comfortable, help is a long ways away. The Hanes Valley route in North Vancouver starts out fairly easy, until you get to this. 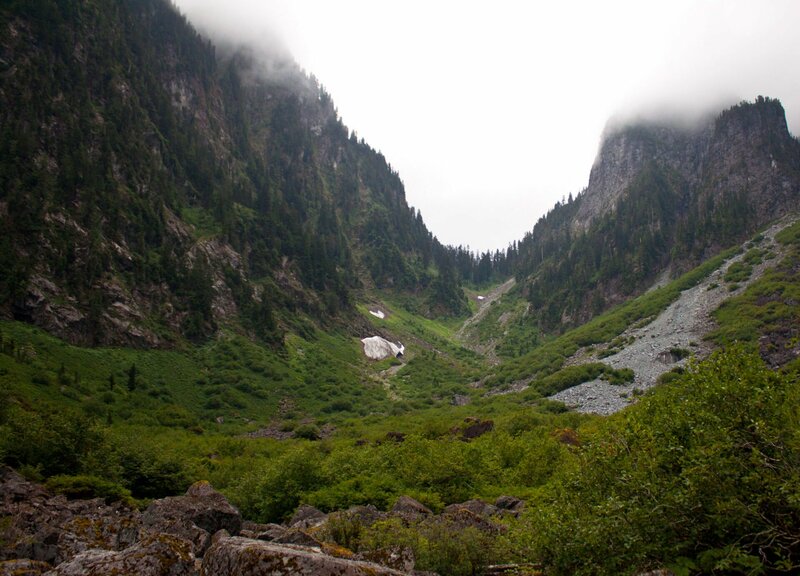 The Hanes Valley is a one-way trail that starts from Lynn Headwaters in Lynn Valley and ends on top of Grouse Mountain. This is not for the faint at heart. 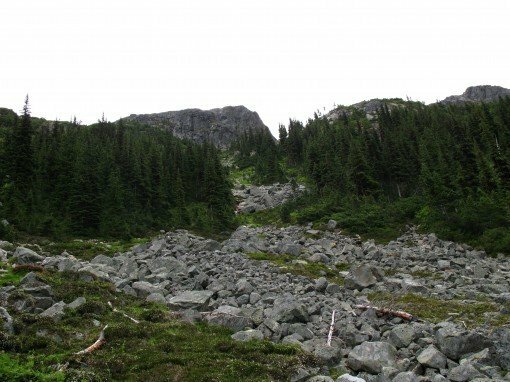 While it starts out fairly easy and you can make great time to Norvan Falls and even well beyond the Hanes Valley / Lynn Lake junction, your pace will become much slower when you reach the steep rock slide. It’s only 1.5km up but you gain more than 800 meters. The sense of accomplishment once getting to the Crown Mountain junction is great, however the next 1km out of the Crown Mountain trail towards Grouse Mountain is also very steep, muddy, and difficult. It should be noted that this trail should only be attempted during the summer months by those who are in very good physical fitness as this trail is one of the areas where the North Shore Rescue is called out to very frequently. I am offended that the Grouse Grind isn’t on this list! Ha, the Grouse Grind is not even in the same league as these hikes. These are much more difficult but also have a great reward in views. The Grouse Grind is a good practice hill for these. I’d agree with you in some respect. Doing the grind in an all out effort under 30 minutes is harder than any of these trails by a long shot. What makes theses trails hard is the fact that they are long and technical, a novice trail runners definition of “hard”. Once you get over a certain fitness level you realize that the most difficult trail isnt the most technical, but rather running any trail in an brutal anaerobic pace. A challenging hike depends on how hard you push.. thats it thats all. The Grouse Grind is a 30-60 minute workout. I wouldn’t call it a hike it that sense. It says hikes. Not sure the Grouse Grind really qualifies. Having done all of these hikes (except for golden ears) The comments above about the grind are a joke and are laughable, and you obviously don’t know what you are talking about. The Grind is not a hike, its a joke, and its stairs. Try doing Black Tusk and Panorama Ridge in the same day, then tell me the grind is more difficult hahahaha. I agree with CL – the Grind is NOT a hike, it’s just a mid-week workout of stairs and is around an hour or possibly a bit less cardio. I have done all of these hikes mentioned and they are all full days – not for the faint of heart and most definitely need preparation with appropriate time allotted, proper gear, food and water. Good for those who do the Grind, but please do not class it in the same categories as these full day hikes as that IS a joke. Having done Crown Mountain earlier this summer, I’d probably add it to the Bonus section as well. It’s a much shorter trail than the others listed but the challenge is you have to drop down into the steep section of Crown Pass, then go up Crown Mountain, then repeat it again on the way back. Both sides of Crown Pass are very steep and switching between muscles for the uphill and downhill sections, then having to repeat them again was pretty tough. Great views from the top though! Mt. 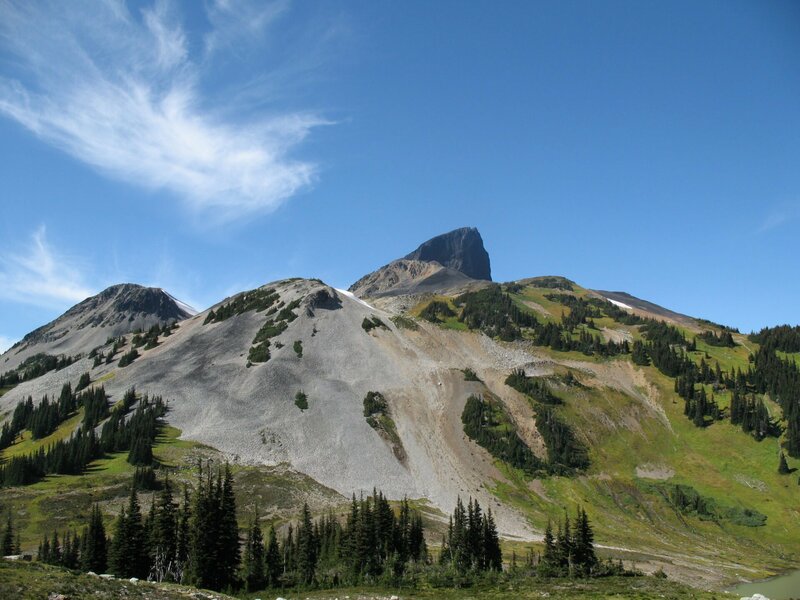 Beautiful(Eagle Peak) via Swan Falls, is a challenging hike on Buntzen Lake. Continuing on Eagle ridge to Eagle Montain is challenge. Did only Wedgemount and Black Tusk, they are both EPIC. Wonder if the Panorama Ridge is worth doing compared to the tusk since I’m bringing my finance with me this time and not sure if I should re-do tusk or do the ridge. BTW the hike to Wedgemount was brutal with a 30+lbs backpack. Leg was sore for 4-5 days but the view was phenomenal so it was well worth the effort. Panorama Ridge is slightly more epic than Black Tusk, in my opinion. The view looking over the lake is amazing. Plus, there’s some nice views looking towards the Helm Lake area that you see as you’re making your way up the Panorama Ridge Trail. I’ve done both, and I would recommend Panorama Ridge over Black Tusk. It’s about the same difficulty but the views are much nicer from Panorama. I just did the Howe Sound Crest Trail from Cypress Bowl to the top of the West Lion yesterday. 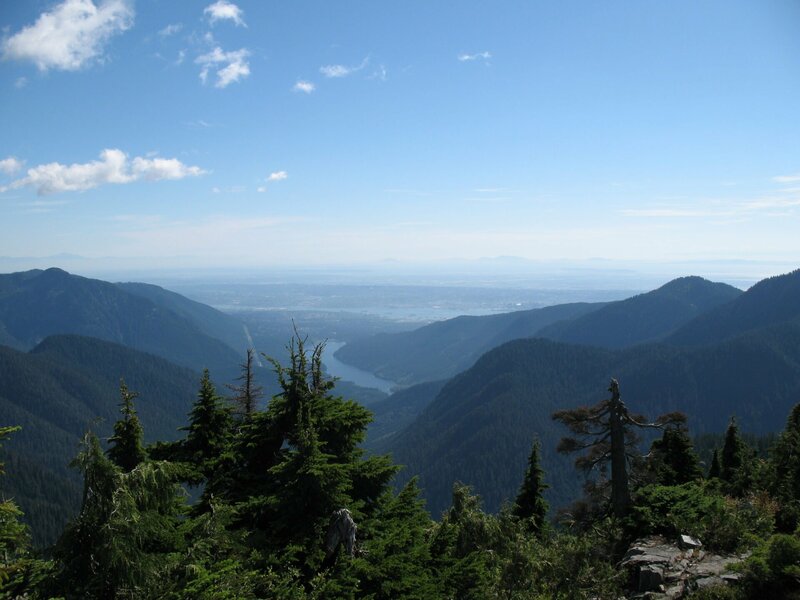 A stunning hike, with possibly some of the best views in Vancouver. I have done Crown Mountain (my personal favourite) 4 times and also Hanes Valley 3 times, and I would say that for me the trail from Cypress Bowl to the West Lion and back was the hardest I’ve done yet. To try to get back before nightfall I hiked a fast pace in the morning, but was nearly fully depleted of energy by the time I got to the Lions. The climb up to the West Lion was very scary at times, and I’d say I’d only recommend it to those will rope rock climbing experience, or indoor wall climbing. Plus you need really grippy shoes for that climb, because all the rocks are slanted downward towards a sheer drop. Every person I met that were at the base of the West Lion either tried to go up and couldn’t make it, or felt it was too dangerous. Only 2 people were up there when I got to the top on a pretty busy day. The route from Cypress Bowl to the West Lion is a really tough hike in my opinion because you basically do 4 summits outgoing and return, plus the West Lion, so that’s 9 summits in all, with very little flat ground anywhere, all tree roots or rocks. It’s relentless and unforgiving. No drinkable water anywhere on the route, so you need to take at least 3 litres per person. I took 2.5 litres and I ran out. Also take plenty of gel packs for energy, another thing I didn’t think to take, thinking “real” food would provide enough energy – No way! Salt loss is a major factor as well. I got back to the car at 8pm after starting out at 9h30, completely exhausted. Another tough hike IMHO is Coliseum Mountain, another hike which is very difficult to do before nightfall. To the person that asked for the Grouse Grind to be put on this list: – I live one block away from Grouse Mountain. I hike up to the top every two days as a workout. I don’t even take the Grind route anymore because it’s too easy. Heck, a blind man could do the Grind it’s now so man-made. The Grind doesn’t even belong on this forum, it’s for babies that have never been out in the wilderness.